I hope you find great value in these Quotes by Woody Allen from my large collection of motivational and inspirational quotes and sayings. 'Be fruitful and multiply,' but not in those words. I believe there is something out there watching us. He had a great idea for a new triangle! dollars a year and spends very little on office supplies. they don't throw their garbage away. They make it into television shows. I don't want to achieve immortality through my work. I want to achieve it through not dying. and later turn it into an idea. only the body has more fun. by his keenly developed moral bankruptcy. 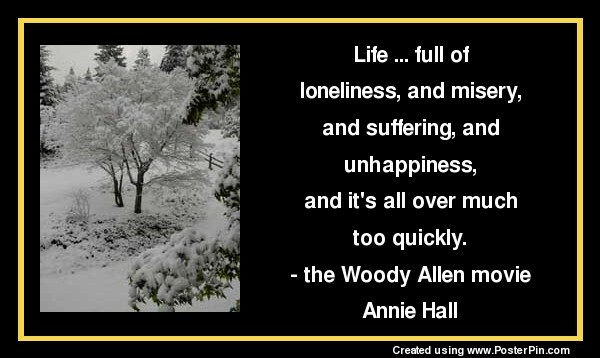 Thank you for visiting: Woody Allen Quotes and Sayings.